Oxfam’s new report, “Public Good or Private Wealth”, shows how the growing gap between rich and poor is undermining the fight against poverty, damaging our economies and fueling public anger across the globe. Billionaire fortunes increased by 12 percent last year—or $2.5 billion a day—while the 3.8 billion people who make up the poorest half of humanity saw their wealth decline by 11 percent. The research also includes that the number of billionaires has nearly doubled since the financial crisis, yet wealthy individuals and corporations are paying lower rates of tax than they have in decades, thanks in part to the new tax law championed by President Trump. The report is being launched as political and business elites head to the World Economic Forum in Davos, Switzerland this week. The 2017 US tax bill is super-charging the worldwide tax race to the bottom and exacerbating the trend of governments dramatically cutting tax rates for wealthy individuals and corporations around the world. 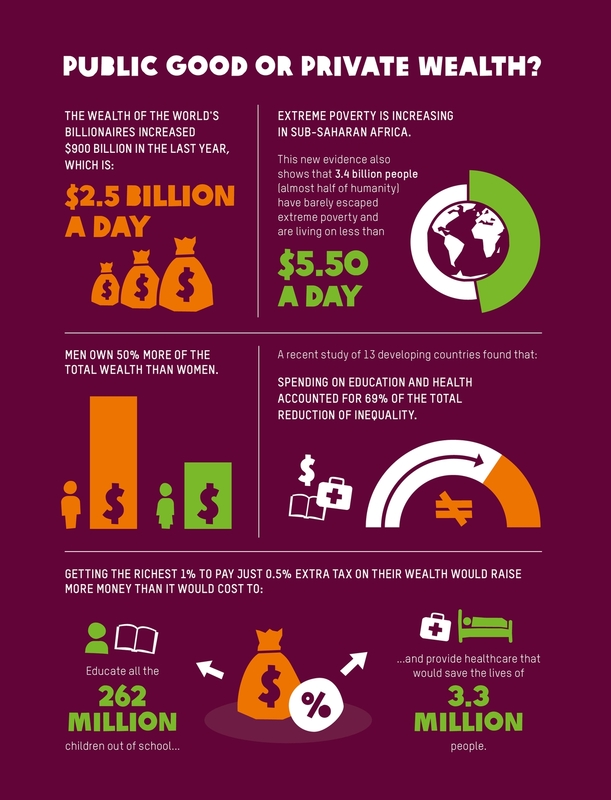 In the US, 30 people hold as much wealth as the poorest half of the population. Cutting wealth and corporate taxes predominantly benefits men who own 50 percent more wealth than women globally, and control over 86 percent of corporations. “The recent US tax law is a master class on how to favor massive corporations and the richest citizens,” continued O’Brien. While governments are under-taxing the wealthy and big corporations, public services are suffering from chronic underfunding or being outsourced to private companies that exclude the poorest people. In many countries, a decent education or quality healthcare has become a luxury only the rich can afford. Every day, 10,000 people die because they lack access to affordable healthcare. Girls are pulled out of school first when the money isn’t available to pay fees, and women clock up hours of unpaid work looking after sick relatives when healthcare systems fail. Oxfam estimates that if all the unpaid care work carried out by women across the globe was done by a single company, it would have an annual turnover of $10 trillion. Oxfam calls on governments to work on policies that ensure all workers receive a minimum ‘living’ wage, eliminating the gender pay gap, protecting the rights of women workers, and ensuring that the wealthy pay their fair share of tax would go far in achieving this goal. In the US, Oxfam pushes for Congress to urgently bring about a new set of tax rules that work for the many, not the few, rules that raise more revenue from under-taxed multinational companies, eliminate the incentives to shift profits offshore, and end the worldwide race to the bottom in corporate tax.